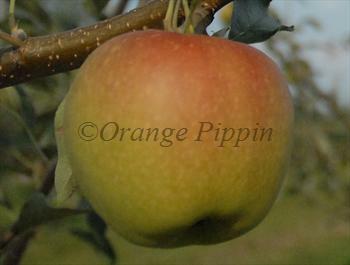 Without doubt Esopus Spitzenburg is one of the great American apple varieties. It has a true aromatic flavor and has been widely praised by American pomologists down the centuries. The noted English author Hogg writing at the end of the 19th century also liked it, calling it "a most excellent dessert apple". This is not a variety to eat straight from the tree - it needs to be stored for at least a month in a cold store (or fridge) for the flavor to mature - and it will keep until well into the new year. The flesh is dense and buttery with a rich sharp yet sweet quality, great for eating fresh on a winter's day - but also useful in the kitchen and good for juicing. Fill in the details below and we will let you know when Spitzenburg apple trees are back in stock. It is almost a truism with apples that the varieties with the best flavor are the hardest to grow. The main challenge with Esopus Spitzenberg is that it has poor disease resistance, although its natural vigour and productiveness helps it to keep going. The flavor is at its best in cooler climates, and like many heirloom varieties Spitzenburg likes warm autumn days and cool autumn nights. However it has a wide climate range and should be successful in the southern states and southern California. Discovered near Esopus, New York, in the 18th century and well-known by the 1790s when Thomas Jefferson ordered some to plant at Monticello.